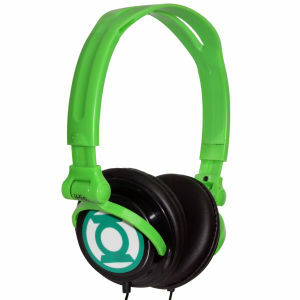 Here we have the officially licensed by DC Comics new iHip Green Lantern Folding Headphones. These deliver outstanding audio while looking fashionable. The adjustable headband sits comfortably on your ears, fitting perfectly in a secure fit. They can Isolate your ears from environmental noise, and the earmuffs house dedicated audio drivers to deliver superb sound. Adorned with a detailed image of the Green Lantern, the iHip Headphones are perfect for every comic book fan. Do you think Ryan Reynolds has a pair?? ?